Madison Coupon Connection: Today's Groupon: $12 for $25 at Talula! 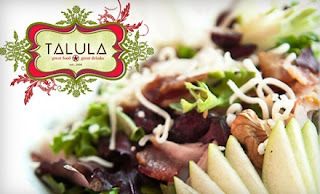 $12 for $25 worth of lunch, dinner or brunch fare at Talula! Talula is located on Atlas Avenue, off Hwy 51 and seems to have great reviews! Here's a clip from one review I saw on Urbanspoon: "Talula is our new "impress out of town friends" place." The menu looks great, too! I've driven by several times and have been intrigued by the name. I've always thought it would be fun to try this restaurant out...& the more I look at the menu & read the reviews, the more intrigued I am! Now, here's a great Talula Groupon Opportunity! Yeah! Limit 1 per table. Tax and gratuity not included. Not valid for Friday fish fry. Not valid with other offers.